Looks like the market will continue to churn the first part of the week. SP500 may set new highs but I doubt we see any substantial upside breakout. Much the same type of action we saw this past week. Not exactly as I expected - up/down/up/down with no clear direction established. It appears though we are establishing a top, but then again it could be a base I suppose.... 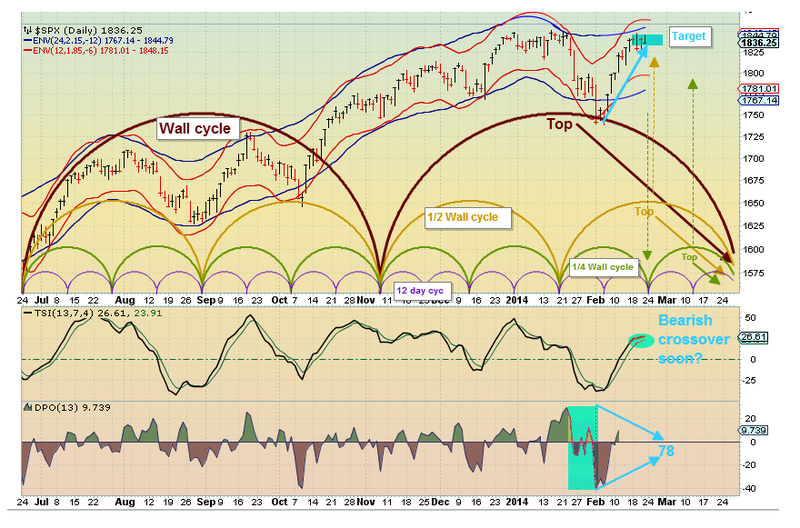 The longer cycles are down, but shorter cycles are up which explains my expectation of churning action. Considering the recent price action and the 3 QE-pomo this week, how are the bears going to break lower? The last two attempts were 17 and 24pts, and now we start a new week, and the smaller hourly index cycles are arguably floored. I guess you are still holding to some kind of major low in late summer? No substantial move near term - possibly churning within a 8-10% band next 2-3 months is my outlook. The TV newscasts and financial guru newsletters are full of bears and bearish comments. No downswing until the bulls start to get the headlines. I'd say another good week for the bulls ahead. JJ - The week just past was mixed with smaller caps up, but the SP500 was flat (down just over 2 points). Not sure you would call it a good week for the bulls or bears - seems it depended what issue you were in. For the first part of the week more of the same seems likely and if we get any pullback it will be mid week or later I believe. Looks like we got a bearish crossover (divergence) for the TSI yesterday. Watching CNBC 4:02PM...all bear talk including Cramer telling everyone to SELL. This market is going MUCH higher. JJ- so far churning in a narrow range as I suggested. Will not surprise me if next 2 days show a bit more volatility and a break one way or the other. I think the odds favor down, but we may set a new closing high SP500 close first.